I had two sources of inspiration for this - Corner Burger and leftover quinoa. It is something you can throw together in a matter of minutes and get a beautiful light lunch or dinner. It is one of those meals that are disproportionally rewarding for the effort you put in. You might have noticed already that quinoa grew for me from a random finding to a new passion. I love the way these grains quietly burst in your mouth while you are chewing them. The way it takes in flavors. The lightness and calm satisfaction it leaves you with. I saw it for the first time at Suki Maman class at Sok (Moscow vegetarian cafe) and then actually tasted it at Corner Burger . Their quinoa tartar topped with fresh tomatoes and crispy salad is delicious and since I tried it I kept carrying it around in my head. This salad is something it transformed into during this time. This is how I would cook it just for myself. I had some leftover cooked quinoa after cooking quinoa with smoky eggplant and roast pepper, so I used it here. However steaming quinoa is now rocket science either and can be done in 30 minutes with almost none of your involvement. 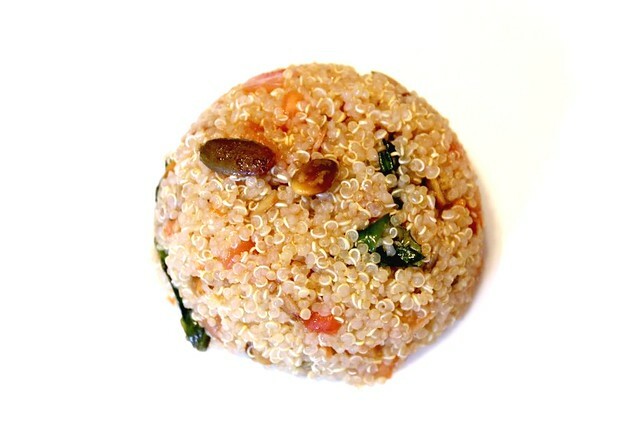 To cook the quinoa bring 150 ml of water to the boil in a small pan, add 1/2 tea spoon of salt and stir in the quinoa. Put the lid on, bring back to boil and cook on low heat for 15 minutes. Take off the heat and leave covered for 15 more minutes. Take the lid off and flake with a fork. Set aside to cool a bit. Toast the pumpkin and sunflower seeds on a dry pan till they turn slightly golden. Remove from heat. In a small bowl combine the lemon zest, oil, vinegar, balsamic vinegar, sugar and salt. Stir to get the sugar and salt dissolved. Add the seeds, tomato, parsley and dressing to steamed quinoa and stir to get everything combined. Serve at room temperature.